I was inspired to ride by the good men in my life and my love for adventure and seeing new places. I grew up mountain biking, scuba diving, skiing, and hiking with my dad and that inspired my love of wild places and a desire to see what was around the next bend. I met my husband in high school and we’ve been best friends adventuring together ever since. We both became teachers and were able to spend our summers backpacking and traveling the world. Once we had children, our travel and adventures were put on hold. About a year ago my husband and I were sitting around with our two young children, feeling a little bored and stuck at home randomly watching “On Any Sunday” and then “On Any Sunday: The Next Chapter” on Netflix. I loved how these movies emphasised family and fun and thought dirt biking seemed like a pretty good way to bring some adventure back into our lives while getting to explore our local areas. My husband has always ridden dirt bikes and got the perfect first bikes for me and the kids, a little Honda 100 dirt bike and our two kids little 50s for Christmas. From the minute I sat on that dirt bike, I loved it. It reminded me of the flow of surfing, skateboarding, and snowboarding. We would take our family out to Gorman and California City for the day and have a lot of fun. I loved riding in the dirt because you could go anywhere you wanted and it felt like there were no rules. I loved getting to see places in nature I wouldn’t normally get to see. As I started getting more into dirt bikes, I came across @babesrideout out Instagram. It was so cool to see real women meet up to ride. When I saw a post about Babes in the Dirt 2 in Gorman, I knew I had to go, at least for the day. In my daily life, I knew no other women riders. I had only ridden with my husband and this would be the first time doing everything alone. I practiced loading and unloading my bike so that I could do it myself. I felt really nervous to be going to this event alone and not knowing anyone. I parked next to some really nice girls and didn’t even need to unload the bike alone because these girls immediately offered to help. I ended up riding with these girls all day. I loved it because they were such rippers. I knew I was a slower rider than my husband, but I didn’t realize how slow I was until I rode with them. Seeing what they could do inspired me to try to ride a little faster. I took a corner too fast that day and ended up crashing. Even though I fractured my ankle, it was worth it to see all those women working together and helping each other. I realized what we could accomplish if we worked together. As I was watching the minibike races at Babes in the Dirt 2 and nursing my fractured ankle with a cold beer, someone there asked me why I didn't have my license and I didn't really have a good answer for them. I had a few months to sit around thinking about bikes while my ankle healed and by then it was the end of red sticker season in California and too hot to ride dirt bikes at places like Gorman. If I wanted to ride more, I realized I would have to get my license and a different bike. I took a safety course and got my license and my husband bought me a perfect first dual sport bike, a Yamaha TW200. Dual sport was the type of riding I wanted to be doing because I could ride anywhere, on any road. Being able to ride both street and dirt felt like complete freedom to me. This last summer we took our kids on a month long rv trip through California, Oregon, Idaho, Montana, Wyoming, and Colorado. We spent the summer paddling lakes, climbing, and riding. I became even more stoked on dual sport because I got to ride in each state and see places I would never see otherwise because of my bike. As I started putting up my dual sport photos on Instagram, I noticed there was no page for women who ride dual sport. We mostly see images of guys riding and a few girls riding at the top level and think “I could never do that” or “That will never be me”. I wanted to see everyday pictures of girls like me who were new to riding and learning to navigate in this sport, so I started @dualsportwomen on Instagram. I think seeing the girl next door pick up a bike and ride is a powerful thing. I love putting up women’s photos and getting messages about how they inspired other women to ride. I know their photos totally inspire me. After summer was over, my husband spent hours modifying my TW for me. I fell even more in love with that bike. When I saw Babes Ride Out 4 was happening in October, I knew right away I had to go to see over 1,800 women riders camping together in Joshua Tree. I was again super nervous to go to this event because I didn’t have too much experience riding on the road and didn’t know if there would be other girls out there riding dual sport bikes. Most girls at this event would be riding street bikes through LA freeways with all their camping gear strapped on the back of the bike. I knew that my little TW and me were not ready for that so I put my bike in the back of my truck wondering if I would be out of place. When I got to the campground, I got lucky again to park by some girls who also rode dual sport bikes and had brought them in their truck all the way from Indiana. They made me feel at home right away. I even met another girl who rode a Yamaha TW200 like I do. Other girls soon camped all around us with their bikes and we shared beers and stories around a campfire. I saw a lot more women riding dual sport bikes than I expected. People were stoked on seeing a Yamaha TW200, especially one that was modified to look so different. A group of us dualsport riders headed out to ride through Joshua Tree National park and we even found a beautiful dirt road in the park that was gorgeous. While we were out riding, my battery died and the girls I was with rode back to camp, somehow found my keys in my truck, moved all my mess of camping stuff, and came back to help me load my bike on the back of the truck. Once again, I was deeply impressed by women coming together to support and help each other. This April I had one of the best weekends of my life at Babes in the Dirt 3. Over 500 women met up at Gorman to ride in the dirt all weekend. There were so many amazing opportunities for us girls at BID3. I got the chance to demo a Husqvarna FE350. I met the women of WLF Enduro and Trailbound. I rode all day with the nicest pack of girls you could ask for. A month earlier, I had recently taken a pretty bad fall in Gorman and had developed quite the fear of hills. I received some excellent coaching and cheers of encouragement from the women I rode with. I was able to make it down some decently steep hills and regain some of my confidence back because of them. This opportunity to meet other adventurous women is inspiring, empowering, and life-changing. Recently we bought a KTM 350 EXC-F for me and a Husqvarna FE450 for my husband, so now we just own dual sport bikes. We plan on taking our kids and dualsport bikes on several camp trips this summer. I plan on attending another all female campout in Washington called The Dream Roll and Babes Ride Out 5 in Joshua Tree this October. These events are like summer camp for grown ups and I have a the best time at each one. Riding with other women has been where I have learned and grown the most as a rider. I hope to get more seat time in the future. As an active couple who both rides, our biggest struggle is balancing who gets to ride, surf, paddle, or climb, while the other one is usually with the kids. We try to take turns and spend our opportunities to have a babysitter riding together. Now that I have the KTM, I hope to get to ride in longer dual sport rides. My ultimate dream would be riding my dualsport to go rock climb. In my experience, the dualsport community is the nicest, most welcoming community around and it makes me so happy to see more women getting into dualsport. I absolutely love seeing what WLF Enduro is doing to bring more women out to the trails. There are a lot of women who ride, most commonly either street bikes or dirt bikes, but don’t always know about dualsport. At any event I go to I am always saying, “Have you heard about dualsport? 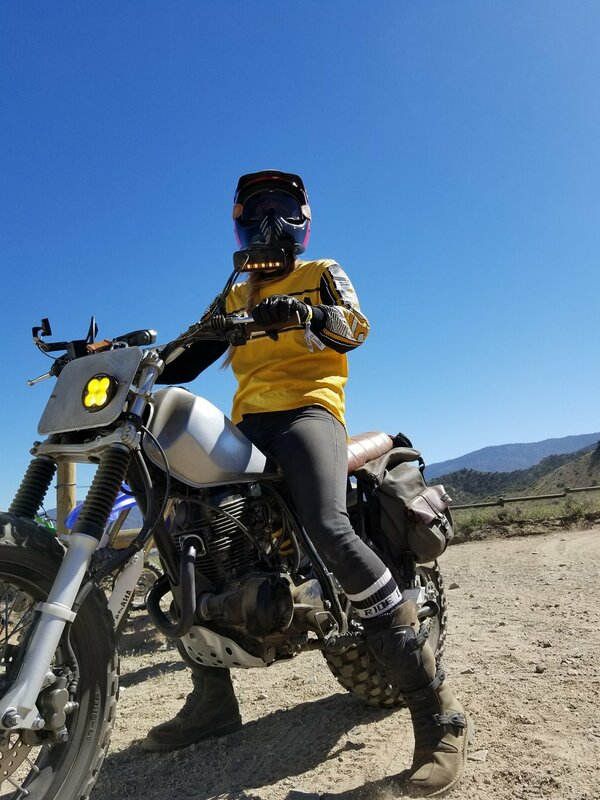 You can ride anywhere, on any road.” As more women start riding, I think they will discover how cool dualsport is and what a nice, friendly, and unpretentious group of people dualsport riders are. The camaraderie among this community is a rare and beautiful thing, and WLF Enduro is the leader in promoting that vibe. Getting to know Sara & Dualsport Women over the last year has been an awesome experience! We couldn't be more excited to see a solid media channel dedicated to highlighting the women of dualsport & off-road motorcycles. We're privileged to have Sara share her story and motorcycle background. Looking forward to teaming up with @dualsportwomen down the road to continue building this amazing community.